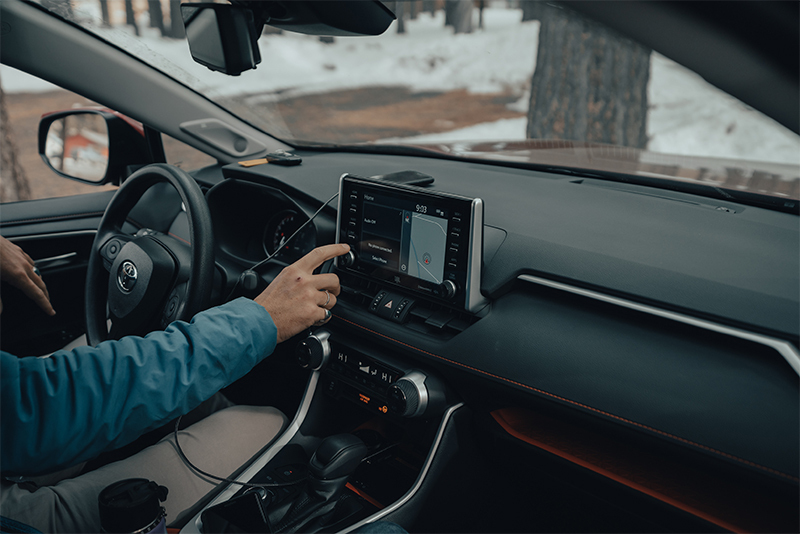 Toyota’s 2019 RAV4 Adventure showcased its road-tripping versatility on an adventure drive that morphed from dawn patrol into ski patrol in one day. The RAV4, fully redesigned for the 2019 model year, was the fourth-best-selling vehicle in the U.S. last year. The subcompact crossover has been revamped to prefer weekend adventuring over a daily commute. That’s why Trucks.com and a group of avid surfing and winter sports enthusiasts tested the RAV4 on an adventure drive that started in Huntington Beach, Calif., and ended in nearby Big Bear Mountain Resort. Also included were the Nissan Rogue SL and the Honda CR-V Touring, the two other top-selling crossovers. When Toyota launched the fifth generation of its RAV4, it highlighted its trailblazing variant, the Adventure grade. Its standard all-wheel-drive system is powered by a 2.5-liter four-cylinder engine that delivers 203 horsepower and 184 pound-feet of torque. The RAV4 had the most power of the group but also had the most underpowered takeoff. “With more horsepower than any of the other vehicles, it’s the slowest off the line,” said Mike Soulopulos, an avid surfer from Laguna Beach, Calif. Soulopulos noted that a weak start can be a danger in some adventuring scenarios. Its eight-speed automatic transmission also shifted too quickly and felt jumpy when getting up to speed. The crossover did not offer a thrilling drive experience – it was more utilitarian in character. But at speed, especially when climbing elevation on twisty mountain roads, it felt confident and planted. 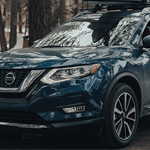 The crossover also grabbed the spotlight when it was able to easily power itself up and over a snowbank at the base of Bear Mountain after the group’s arrival at Big Bear Mountain Resort. Its multi-terrain drive modes, which include Mud & Sand, Rock & Dirt, and Snow, enable it to handle varying on- and off-road conditions. The RAV4 Adventure comes with a host of driver-assist technologies that make road tripping easier. Its adaptive cruise control and lane-departure alerts with steering assist were the most useful on long highway driving through light traffic. Both were easy to activate with buttons on the wheel, and the three following distances offered felt trustworthy. But its steering assist feature was a little unnerving at times. The system often hugged one side of the lane too closely, which can cause discomfort while driving alongside a truck or dividing wall. Unlike Nissan’s system, which lost points for overactive steering, the lane keep can be turned off while the adaptive cruise stays on. The RAV4 Adventure also has new, rugged looks when compared with the other trims in the lineup. However, next to the Honda CR-V and the Nissan Rogue, it appears smaller and lacks rear cargo space. It has 2 cubic feet less space behind the second row compared with the CR-V’s 39.2 cubic feet and the Rogue’s 39.3 cubic feet. Standard raised roof rails were a helping hand, however. All 2019 RAV4 trims come roof-rack ready. Trucks.com installed Thule Aeroblade crossbars with a Snowpack Extender ski and snowboard rack, which holds up to six pairs of skis or four snowboards (we loaded it with two sets of skis). Less interior space means it’s also a tighter fit for taller drivers. Front headspace in the RAV4 with a moonroof measures 37.7 inches. Hip space is 53.4 inches. Both the CR-V and Rogue have more of each and offer seats with a more premium feel. But given the choice, adventurers prefer a durable interior like the Toyota’s. “The seats feel like leather but would be able to take a beating, and would be easy to rinse and clean,” Soulopulos said, adding that real leather was not ideal because it hardens over time with repeated exposure to water from wet towels and trunks. He was also wowed by the rubber lining and plastics that made up the RAV4’s interior for the same reason. Orange contrast stitching on the black seats, along with orange accenting on the many small storage compartments, gives the interior a sporty feel, which adds to the perception of its toughness. The RAV4 Adventure’s 8-inch infotainment display was the largest in the group by one inch, but the built-in navigation system was too complicated. There was no obvious way to turn the split screen feature off to only show the map. The climate control function is embedded in the system but was intuitive and easy to use. There is a 7-inch “multi-information display” behind the wheel that serves as the gauge cluster, but it’s also cluttered with information that makes it hard to absorb when driving at higher speeds. But the availability of Apple CarPlay and Android Auto was a plus. The group often defaulted to the familiar platform, especially when navigating complex freeway changes in the first half of the drive. It also allowed them to access their own music, which highlighted the JBL premium audio system. A wireless charging station sits below the display screen, as do four USB charging ports. Music is a road trip necessity, especially in the RAV4. Quite a bit of road noise reverberates through the cabin while on the freeway. It could be due to the lighter-weight materials Toyota used to make the crossover more fuel-efficient. The Environmental Protection Agency rates the RAV4 Adventure at 25 mpg in the city, 33 on the highway and 28 mpg overall. The Rogue is rated 25 in the city, 32 on the highway and 27 overall. The Honda scores slightly better with 27 mpg city, 33 mpg highway and 29 mpg overall. The ratings combined with real capability and durability make the RAV4 Adventure a compelling package for buyers, especially for those migrating away from sedans. It also comes with an affordable price tag. With no extra options, the RAV4 Adventure costs $32,900. Premium audio and other adventuring technology like rear cross-traffic braking, a digital rearview mirror, and power tilt and slide moonroof jump the price to $38,535, including a $1,045 processing fee. Toyota’s new RAV4 Adventure hits all the marks for an adventure vehicle despite its smaller interior space compared with its peers. It was the most suited in the group to serve as a sand and snow vehicle because of its interior materials and off-roading capability. Our team found it versatile enough to double as a daily driver and a weekend warrior.